LAKEVILLE, IN. 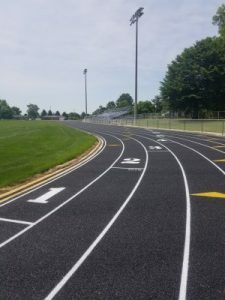 – The current athletic project continues to see positive strides on the campus of LaVille Jr-Sr High School. 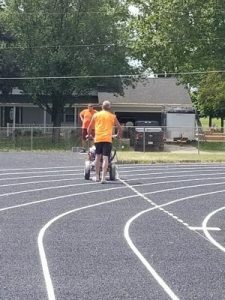 LaVille Athletics recently found the striping crew on the track putting the final touches on track lines, markings, and numbering the lanes. 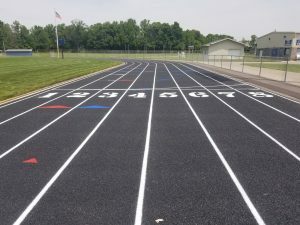 “Upon completion, our track and football area will be among the finest in our area,” explained the UNUSC superintendent. “The football field sports a beautiful Kentucky Bluegrass plus a new scoreboard, time clocks and goal posts. We were able to win the sectional final on Lancer field this past fall, and we plan to continue this for many years to come. The football field is also receiving much-needed improvements. Final touches will help finish the project in the coming days. The striping crew came from Ohio and travels throughout the United States. Last year, the put over a million over the road miles and went from the west coast to the east coast in a matter of four days! *Photos courtesy of LaVille Athletics. All rights resereved.